Shimmy Shimmy Cocoa Puffs! 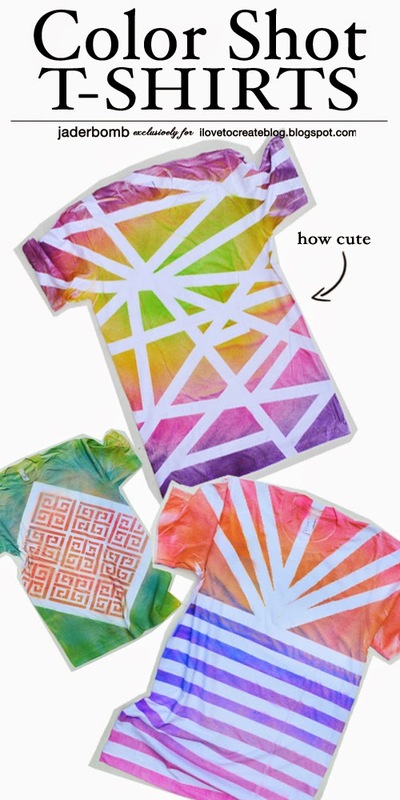 DIY shirts are all the rage lately. 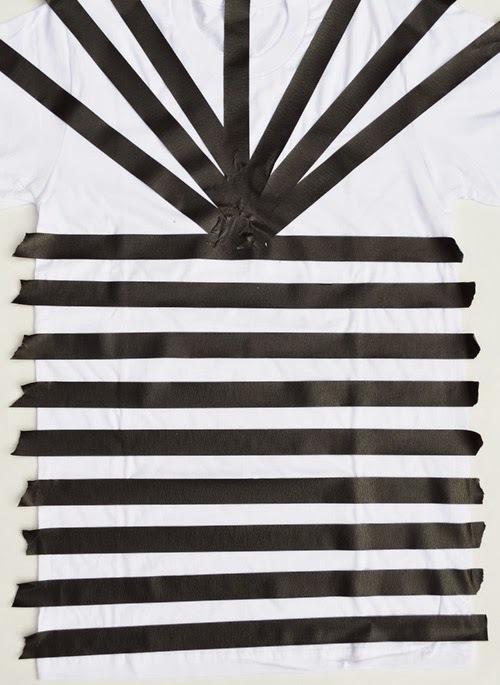 I am all about spicing up T-Shirts and giving them a new take on life! 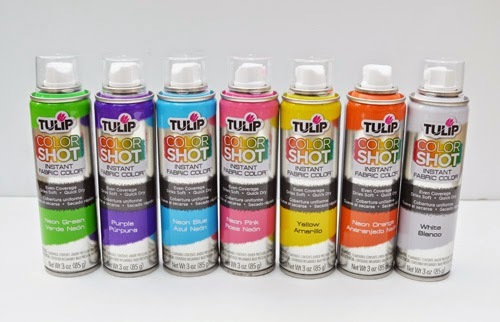 I am super stoked about this new product by Tulip! I can promise you that once you see how easy they are to use you are going to be RUNNING to the store! Let's get started because you are going to LOVE THIS! I love how vibrant the colors are. 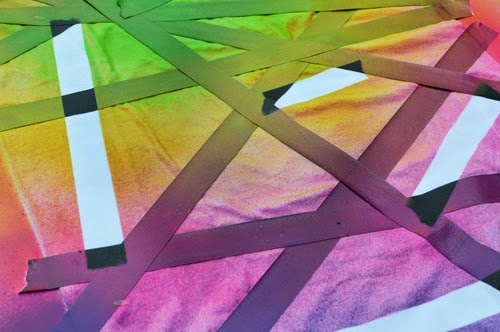 You will flip out when you see how pigmented they are once you start spraying them. 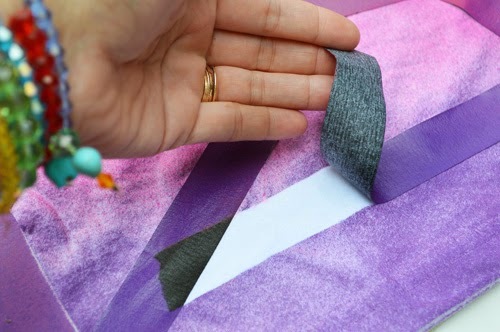 Step 1: Get your fabric stencil tape and start creating fun designs with it. 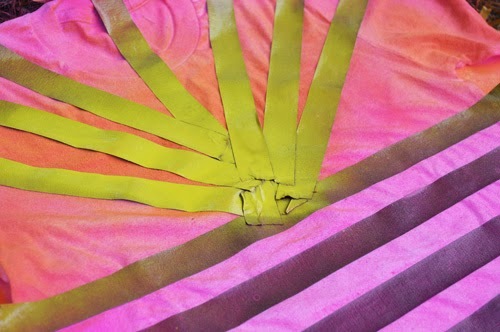 The good thing about color shot is you can spray the entire shirt and the party starts when you peel the tape off! 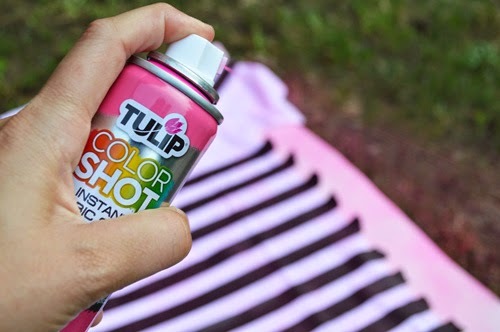 Step 2: Shake the can for about 1 minute then spray a little in the air before you attack your shirt. 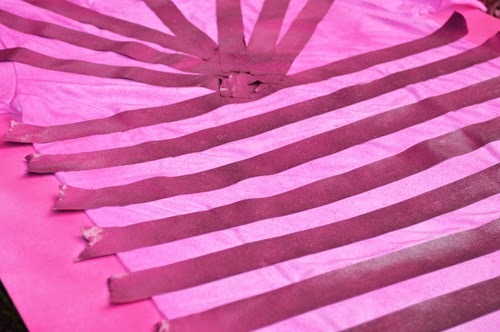 Make sure to hold the can 6-8" from the fabric and spray with smooth, even strokes. Apply one light coat at a time, waiting 5 minutes between coats. You can add additional coats for desired coverage and intensity. This is about 3 coats. It's amazing how bright the colors get. 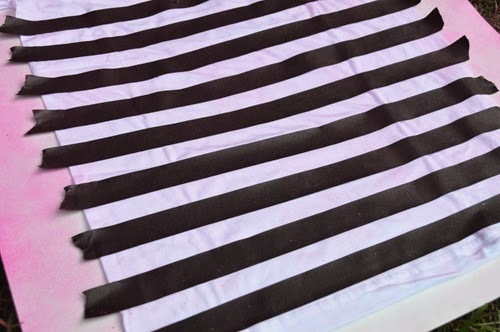 It's very easy to create different shades next to each other and they blend so nicely! I wanted to go a little further and place a stencil down to see how it would turn out. I have to say it's so easy! 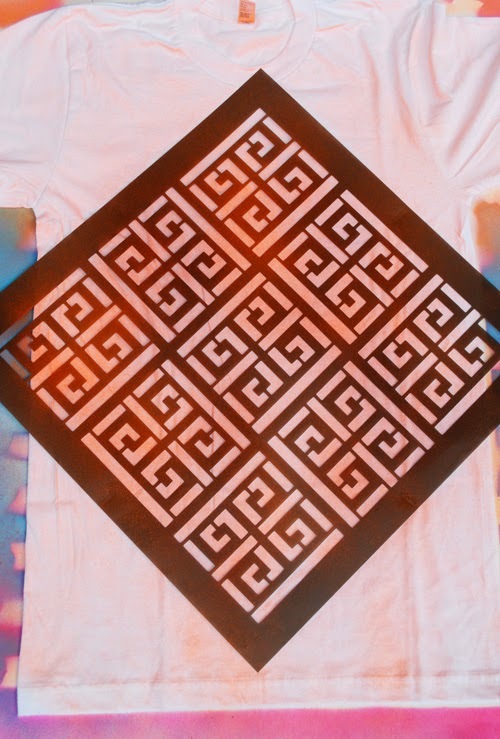 I suggest spraying the back of stencil with an adhesive spray to ensure the stencil stays in place. 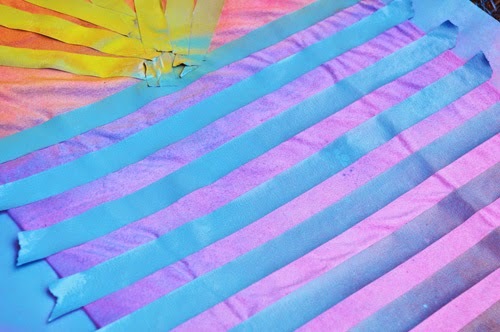 How gorgeous are these colors! I want to do curtains now!!!! 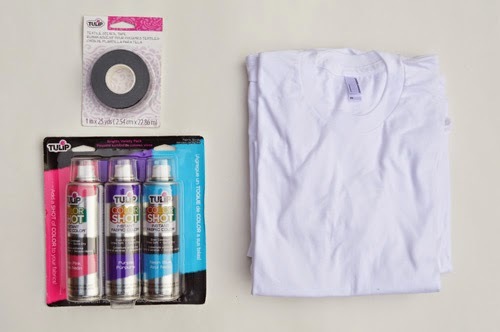 Make sure to let your shirts dry over night, with the tape still on them. After 24 hours gently peel the tape off. I think I may have started squealing when I saw what it looked like under the tape. This can sometimes be the stressful part because you are always wondering if the paint leaked under the tape! NO MAM IT DIDN'T. 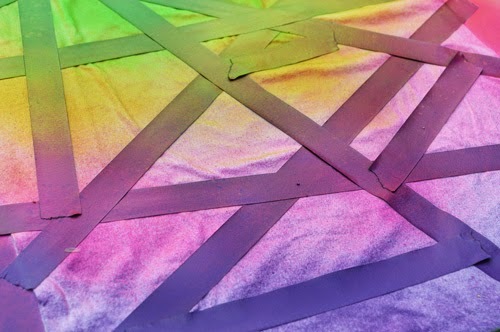 It's like GEOMETRIC happiness hidden under the tape. Turn the shirts inside out and wash by them selves then dry on tumble dry. I would only do this the first time washing them! 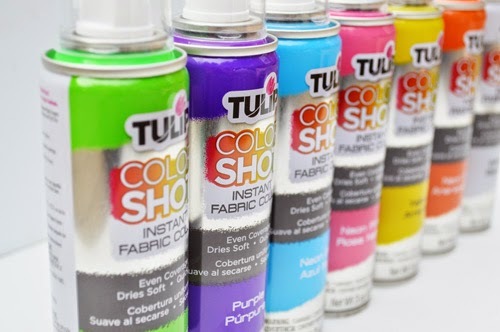 So if I wanted to do this with a class of kids, how much paint do you think I would need? Also, how much does the paint cost? Awesome... Your post is just outstanding! its really going great work. Great, Thanks for sharing this useful info. I couldn't tell if you put something inside the shirt to keep the paint from leaking through onto the back. Please clarify. I enjoyed your informative post. Thank you for sharing. Thanks for Sharing such imported information with us. 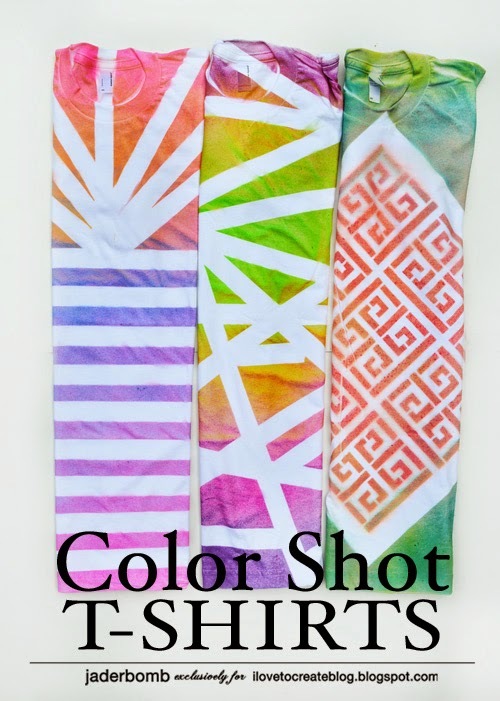 I hope you will share some more info about Color Shot T-Shirts. please keep sharing!